The Aquascape Backyard Waterfall Landscape Fountain Kit bundles the perfect combination of products, providing everything needed to create an impressive, one-of-a-kind Pondless waterfall. The included AquaBasin 45 simplifies installation and is able to store up to 98 gallons, minimizing maintenance significantly. Constructed of professional-grade, high density polyethylene and backed by a lifetime warranty, the basin will provide features and benefits that eliminate guesswork, improve water circulation, and increase accessibility. 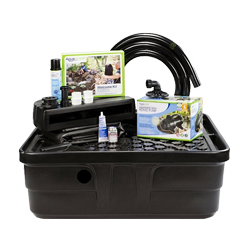 The kit also includes an extremely energy-efficient AquaSurge pump, EPDM liner, Flexible PVC Pipe and more.